Here are two wonderful books for you to consider for your kids on this wonderful day. Merry Christmas and enjoy. Luminous paintings and fascinating facts of Snow Leopard, Himalayan Tahr, Tibetan Wolf and more. 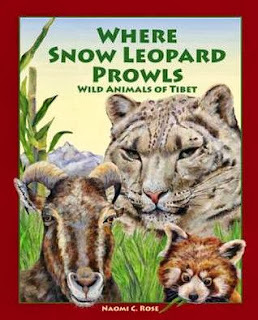 Where Snow Leopard Prowls will inform, engage, and inspire readers of all ages, and will foster a personal connection to wildlife and our natural world. Includes a glossary and suggested activities. More activities are available on the Rose's website. I am familiar with this author as I once reviewed her book Tashi and the Tibetan Flower Cure. She has done an excellent job with this book, once again bringing us to and teaching us about her love of Tibet. This was a beautiful book. The reader is introduced to thirteen Tibetan animals and their habitats. I had no idea until I had read this book that there were so many habitats in Tibet. I had only heard of two of these animals before reading this book. The author has done a wonderful job of describing the food and preditors, camouflage and escape methods of the Snow Leopard, Tibetan Wolf, Wild Yak, Tibetan Black Bear, Kiang, Blue Sheep, Chiru, Tibetan Tahr, Musk Deer, Red Panda, Golden Snub-nosed Monkey, Himalayan Marmot and Black-necked Crane. I enjoyed not only the facts about each animal but the glossary that will help readers unfamiliar with some of the words. I plan on checking out many of the resources listed at the back at the book to learn more about these animals I had never heard of before. Although I received an e-version of this book from the author I plan on adding this to my home library for my grandkids to enjoy. There is so much to be learned from this book. If you want to learn more about the author or her books you can check out her website. Jake moves to a new town and a new school. He is sad in his new school and has a frown on his face as he goes to his seat. Amanda sits next to him and tells the teacher about a game that might help Jake. The kids must go to the front of the class and tell a story about a time they made a funny face. The students, teacher and principal all tell stories and show their funny face. Jake's turn is last. He stands and shows the students the face that all of their stories have created. It is now a great big smile.This was a fun picture book written in rhyme. 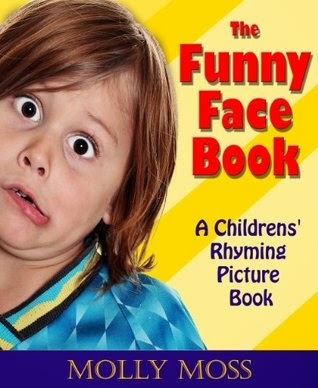 I believe kids will really enjoy the different stories told by the children and will especially enjoy making the funny faces.